From the beginning of Vikings Season 5, we have known that the whole story would be building towards the civil war between the sons of Ragnar Lothbrok and now when it's almost time for the mid-season finale the battle we have all anticipated is upon us. I for one am glad they didn't save this moment for the exact episode break because then we would be left for months without getting to see the results of the fallout as well. There was even a small amount of time given to the stories with Wessex and Floki's (Gustaf Skarsgard) island group to keep the ball rolling there as well. Let's talk about the opening acts of The Joke first before we jump to the main event! The unrest among the group of folks that Floki has brought to his island paradise is really starting to boil over and not in a good way. While he does have those that have decided to make a go of it and are trusting in Floki's vision that this could be a great new place for them to live he still has a few who feel cheated that they have been lied to. The conflict stems from Floki bringing up that he wants a temple built in the name of the god Thor in dedication to show appreciation for the land they have been blessed with. While a man named Kjetill Flatnose (Adam Copeland) offers to have it constructed on his land, this draws criticism from Eyvind (Kris Holden-Reid) and few others because they haven't even begun to make their own houses yet. They are more worried about food and crops seeing as they know that winter will come and they will have no way to survive it without provisions. While it seems that Eyvind might have a legitimate concern the only answer we get out of Flatnose is "We will turn this land into somewhere wonderful to live!" That's some great positivity, buddy but how do you plan to make it happen? Floki decides to speak his mind and tells Eyvind he can return home if he is so unhappy but that just makes him more upset. He tells Floki that they can't return home-ever-because they left Lagertha (Katheryn Winnick) when she needed them so now they can't ever return. Well, sounds like he better spend more of his energy on making things better instead of being a "negative Nancy!" Later on, we would see Flatnose and some others working on building the temple but Eyvind is nowhere to be found. Guess he's just going to talk trash and be part of the problem over the solution. I do find it strange how Floki spoke in the last episode how he has no desire to be king yet all these people are working and he just stands up on a hill and looks down on them? Hey, Mr. Man-of-the-people, can you pick up a hammer or something? Over in Wessex, Albert (Ferdia Walsh-Peelo) has returned from Lindisfarne and is talking to his mother Judith (Jennie Jacques) about how he feels that the monks he visited need to begin arming themselves and building ships to defend from another Viking attack. When Judith suggests talking to his father about it, he says there's no reason because he won't listen. He goes on to say that the man is too old-fashioned and stuck in his ways. I know I've said this before, but I continue to not understand why we are being given updates on this group of characters. It doesn't seem to be going anywhere and now that Ivar (Alex Hogh) and most of his army have left it seems very pointless. I do hope they give us some relevance for including the Wessex Chronicles soon! Now that we're done with all that, let's move on to the big drama we've all been waiting for! 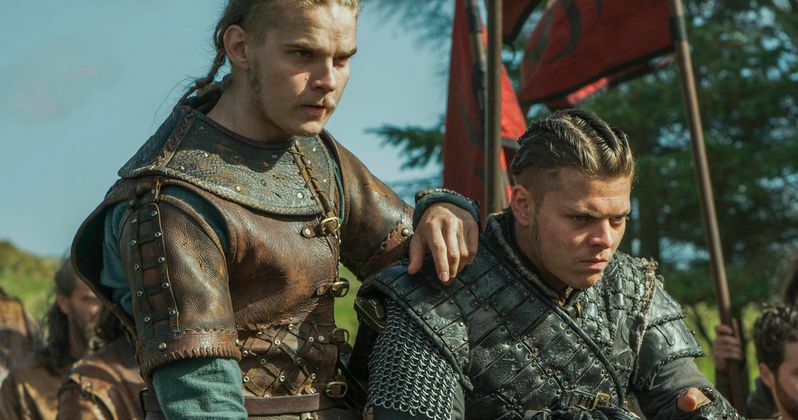 Ivar is more than ready to enact his revenge on Lagertha as he boards one of the ships with his brother Hvitserk(Marco Ilso) to sail out for Kattegat. He announces how he has been very impatient to" fulfill his promise to the gods to kill Lagertha." As they are waiting to sail Bishop Heahmund (Jonathan Rhys-Meyers) walks by and Ivar stops him to give him a present-he returns his sword to him. This shows how much Ivar has grown to trust Heahmund and that he is anxious to have him fight on his side. At the same time, they are having their Bromance moment King Harald (Peter Franzen) is talking to his wife Astrid (Josefin Asplund) because she wants to come with him to the battle but he is opposed to this since she is pregnant. She tells him firmly that she is going with and that she "has already made up my mind." Harald realizes it is pointless to try and talk her out of it so he just gives in realizing he has chosen a very strong woman to take as his wife. Over in Kattegat, Lagertha and Co. are gathering their troops as they ready to leave themselves. Bjorn (Alexander Ludwig) is excited to take his son Guthrum (Ben Roe) into battle for the first time and even though she is not happy about them being separated Torvi (Georgia Hirst) doesn't let it affect the love she has for her children as she leaves them with Margrethe (Ida Nielsen). As her and Ubbe (Jordan Patrick Smith) walk away together, there is definitely some resentment in Margrethe's eyes after she saw them kiss last week. When both armies get to the giant battlefield, they decide to send out emissaries to try and work things out first. Hvitserk goes over to Lagertha's camp and Halfdan (Jasper Paakkonen) goes to his brother Harald's side. The agreement is they will stay overnight there and try to work out a peaceful solution to prevent an unnecessary slaughter of their troops. The funny thing is both sides just try to do the same thing in trying to convince the person that comes over to defect over to their side. King Harald especially tries to get Halfdan to come over saying that just because Bjorn saved his brother's life he should want to be loyal to his blood brother more. The next day they all gather in a very orderly square surrounded by soldiers from both sides to discuss if there is any way they can come to an agreement. While Bjorn and Ubbe try to make their plea that they do not want to fight their brothers, Lagertha goes a different route and reminds Ivar that she is the rightful queen of Kattegat but they should join their armies to expand their empires instead of going against each other. She also tells Ivar in particular that if he does this, he loses either way because he is going against his brothers and the spirit of Ragnar will weep over it from Valhalla. Somehow this actually convinces Ivar and he says that he does not want to fight against his brothers and he takes back his promise of wanting to kill Lagertha. I don't buy this for a second! There is no way that he has just given up wanting revenge and changed his mind. And later on, it would be proven to have just been Ivar being a jackass as he throws his drink in Ubbe's face as they were toasting his fake peace agreement. He reveals to Ubbe that he could never forgive Lagertha for killing their mother and he goes on to announce that "of course I'm going to kill her!" The best part is that Lagertha herself is not shaken in the least and simply replies to his outcry with "you can try." For all the Margrethe thinks that Lagertha is losing her strength as a queen this is a simple demonstration of how wrong she is! To add salt to the wound Ivar tells Ubbe that he is no longer his brother so he won't be thinking about it in that way when he fights him. Both sides slowly back away from each other with the first action being thrown when Harald punches Halfdan in the face to express his disappointment with him. As they continue to walk away, Astrid and Lagertha lock intense gazes at each other with what seems like mixed signals since we know Astrid went to great lengths to warn them of the attack. Speaking of, how come no one on Ivar's side seems puzzled that they knew they were coming? With both armies now back on opposite ends of the battlefield, the drums are loudly pounded as each side waits for the other one to make the first move. Ivar's strategic brain starts going into hyperdrive as he is trying to figure out what Bjorn is planning on doing to attack them. He comes up with taking part of their army to protect their boats and then also sending another group (led by Hvitserk) into the woods so they can try and outflank their opponent. King Harald and Heahmund will lead the main part of their forces against Ubbe and Bjorn but Astrid is forced to go with Ivar because her husband wants her out of harm's way. With that plan set in motion Harald signals his troops to start moving forward and with that Bjorn also sends his men full throttle to meet them head-on. What would proceed to happen is maybe one of the best battle sequences ever done in this series. It's an intense and chaotic mash-up of swords and axes flying while the sounds are of ferocious grunts and painful shrieks as lives are taken down one by one. We see many instances of all the main characters in the midst of combat and showing off their fighting skills. Ivar stops his trek to their boats because he can't escape his desire to at least hear how the battle outcome happens. In the woods, Hvitserk and his men are ambushed by the Sami forces and are taken down quickly as they are attacked from both sides and unable to defend themselves. We were told the Sami were very useful if they were in the trees so they proved to be a valuable asset. Not knowing what has happened to Hvitserk, King Harald sends in his second wave of troops to try to deliver more of a blow while Bjorn still leaves his reserves in standby. But his idea to deliver a crushing move is foiled when Lagertha and a large group of soldiers come out of the woods from behind and surprise them. While they are taken aback by this action, Bjorn then sends in his reserves to give reinforcements from the other side. For some puzzling reason, Ivar can hear sounds from the battlefield and doesn't seem concerned about helping out Harald even though Astrid suggests they join the fight. Even still when Harald has the horn blown to signal for help, Ivar thinks it is too late to help them so instead holds his position far away. As Lagertha's forces continue to gain dominance over Harald's group, even Bishop Heahmund himself seems to get overwhelmed by the fighting and is in a daze of sorts. Even though he tries to fight on, he would be eventually taken down and considered left for dead by Harald as he would sound the retreat. The clever planning of Bjorn, Lagertha, and the Sami was too much for King Harald and his army. As Lagertha and Ubbe would survey the battleground afterward they discover Heahmund and realize he is still alive. Lagertha decides to spare his life and has her men take him away to be treated for his wounds. This is easily the highlight of the season and was everything we could've wanted in this battle of brother vs. brother. My only complaint would be that we never saw any of them fight each other in combat but maybe that is what is to come for the finale. The fact that Margrethe has criticized Lagertha and called her weak was put to rest here as she held her own and took down many of the opposing soldiers with her sword. I hope that Ivar not coming to King Harald's aid will cause some mistrust between them and lead to more conflicts where they question if they are even still on the same side. Congratulations to Showrunner Michael Hirst on a well-executed episode that showed even with Ragnar Lothbrok gone, this History Channel show has lost nothing in being amazing.